The Legal History & Rare Book Special Interest Section and the FCIL-SIS Roman Law Interest Group had a joint meeting on July 21st to hear a fantastic talk on researching the Corpus Juris Civilis (CJC) by Fred Dingledy, Senior Reference Librarian at William and Mary Law. 4) the Novels: posthumous compilations of Justinian I’s constitutiones. Fred also noted the organizational problems of the CJC, which can make it difficult to research. Fred then explained about the medieval revival of CJC, and the subsequent translations of each of the four components of the CJC. He discussed the pros and cons of the various translations, and provided attendees with an annotated bibliography noting how to find those translations. Sources for various translations of each of the CJC’s components are available at online sources like Hein Online or for free at the Internet Archive. Want to read the whole CJC in the original Latin? Check out the edition by Krueger et al., which is considered to be the most authoritative version. Finally, Fred talked about the relevance of the CJC through the Anglo-American English tradition, as the CJC was also very influential on many continental European legal codes; scholars such as Francis Bacon, John Adams, and William & Mary’s own George Wythe discussed it or cited it in their works. Fred also noted that it was cited as recently as 1997 in a U.S. Supreme Court case, Idaho v. Coeur d’Alene Tribe of Idaho, 521 U.S. 261, 284 (1997). Many thanks to Fred for a very interesting talk, filled with fun anecdotes. The FCIL-SIS Publicity Committee meeting occurred at 6:00 p.m. on Sunday, July 19, 2015, at the AALL Annual Conference in Philadelphia, PA. The co-Chairs of the Committee, Susan Gualtier and Loren Turner, were joined by Anne Burnett, Daniel Donahue, Mark Engsberg, Anne Mostad-Jensen, and Megan O’Brien. The meeting focused on the Committee’s current initiative, the FCIL-SIS blog, DipLawMatic Dialogues. The group discussed the effect of recent blog posts. The Committee was pleased that (1) Alison Shea’s recent post on EU citation had gone viral; (2) the blog had been receiving a lot of interest in and contributions from new/generalist law librarians (not just those with FCIL titles), particularly related to the book review column; and (3) many FCIL-SIS members commented on their enjoyment of the member profiles column, which introduces (or reacquaints) FCIL-SIS members to each other. Turning to future initiatives, the Committee discussed ways to increase blog content and impact. Among the suggestions: amplify conference coverage – especially recaps of programs occurring at international conferences that many FCIL-SIS members cannot attend; highlight particular collections (print or digital) of individual libraries to promote those collections and to provide FCIL-SIS members with a contact at those libraries; and recruit technical services staff trained in FCIL work (cataloging, acquisitions, etc.) to contribute blog posts. Additionally, the Committee agreed to work towards developing style guidelines to provide interested bloggers with a preferred structure for blog posts. The Committee also discussed ways to market the FCIL-SIS to all AALL members, particularly when designing program topics for annual conferences. The FCIL-SIS must show the Annual Conference Program Committee that there is a wide interest in FCIL librarianship – whether or not one is designated an “FCIL” librarian. The Committee brainstormed possible slogans to project inclusiveness, such as “FCIL Librarianship is Reference Librarianship.” The Committee agreed to work on publicizing the blog and the FCIL-SIS in general AALL materials (e.g., AALL Newsletter, AALL discussion boards, etc.) in order to make the FCIL-SIS less intimidating/more accessible to those without an already-developed expertise (while still maintaining its value amongst those who are specialized in FCIL work). The meeting was adjourned at approximately 7:00 pm. Established 2006, The Daniel L. Wade FCIL-SIS Outstanding Service Award honors an FCIL-SIS member who has made outstanding contributions to the Section in the areas of section activity and professional service. This year’s recipient is Jonathan Pratter, International & Foreign Law Librarian at the Jamail Center for Legal Research of the Tarlton Law Library, University of Texas School of Law, in recognition of his three decades of service to the students and faculty at the University of Texas and the members of the FCIL-SIS. Jonathan joined the Tarlton staff in 1985. He serves on the editorial board of the Texas International Law Journal and the Boletin Mexicano de Derecho Comparado. Jonathan has written numerous articles and book reviews, many on Mexican law, and especially noteworthy is his GlobaLex article “A La Recherche des Travaux Preparatoires: An Approach to Researching the Drafting History of International Agreements. Jonathan is the recipient of the Carl H. Fulda Award from the Texas International Law Journal for his “contribution to the scholarship of international law,” and just recently a member bursary to attend this year’s IALL Conference in Berlin. Jonathan served as the ninth president of the FCIL-SIS, his term being 1993-1994. He has been a panelist on several programs at AALL annual meetings, most recently last year’s excellent “Mexican Law and Legal Research: Overcoming the Challenges for which he and Julienne Grant edited an extensive research guide to Mexican law and legal resources. He has been an active member of the FCIL-SIS and Int-Law for many years. Jonathan, thank you for all you have given your colleagues in the FCIL-SIS! The Thomas H. Reynolds and Arturo A. Flores FCIL-SIS Publications Award is named after the indomitable authors of the Foreign Law Guide: Current Sources of Codes and Basic Legislation in Jurisdictions of the World, better known as “Reynolds & Flores” to the many grateful FCIL Librarians who habitually use the Foreign Law Guide. The Award is given to FCIL-SIS members who have greatly contributed to the professional development of their AALL colleagues during any given year. The winning publications may be print, digital, or electronic initiatives. This year, three colleagues have been awarded the Reynolds and Flores Publication Award for two bodies of work. Mirela Roznovschi – Mirela recently retired from New York University Law Library where she was the Reference Librarian for International and Foreign law since 1996. 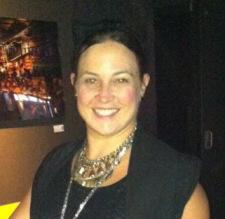 She is both the brains and the brawn behind GlobaLex, celebrating 10 years in 2015. GlobaLex is an electronic legal publication dedicated to international and foreign law research. Published by the Hauser Global Law School Program at NYU School of Law, GlobaLex is committed to the dissemination of high-level international, foreign, and comparative law research tools in order to accommodate the needs of an increasingly global educational and practicing legal world. The guides and articles published are written by scholars well known in their respective fields and are recommended as a legal resource by universities, library schools, and legal training courses. Many congratulations to Mirela on both the 10th Anniversary of GlobaLex as well as her well-deserved retirement. Alison Shea and Ralph Gaebler – Alison is a Reference Librarian, Foreign and International Specialist, and Adjunct Associate Professor of Law at Fordham University School of Law Library. 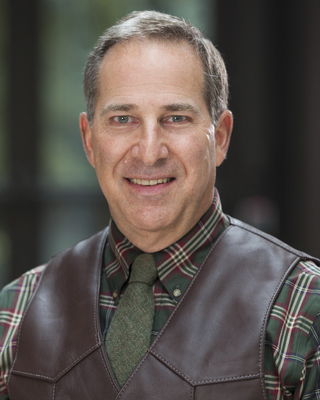 Ralph is an Associate Librarian and Lecturer in Law at Indiana University’s Maurer School of Law Library. Together, Alison and Ralph are co-editors of the second edition of Sources of State Practice in International Law. This volume is a dense descriptive bibliography of both electronic and printed sources of information containing the text of treaties and the record of diplomatic activity of important jurisdictions around the world. It includes an up-to-date description of national treaty portals and other valuable Internet-based sources. At the same time, it also includes descriptions of printed sources providing access to treaties and official diplomatic documentation difficult to locate in standard compilations. In addition, this work includes a narrative section for each jurisdiction summarizing issues related to treaty succession and treaty implementation in municipal law. The Spirit of the FCIL-SIS Award is presented each year to members whose work furthers our mission, serves the entire FCIL-SIS, and inspires other to act. This year, three colleagues were awarded the Spirit of the FCIL-SIS. Susan Gualtier – Susan is the Foreign, Comparative, and International Law Librarian at Louisiana State University and has been an active member of the FCIL-SIS since she began her work as an FCIL librarian four years ago. She has been instrumental in getting DipLawMatic Dialogues up and running, and has tirelessly pursued contributions to the blog along with co-editor, Loren Turner. She has initiated new features of the blog including FCIL Research Instruction and film reviews. She also is excellent about publicizing the blog both via the listserv and via Facebook, thereby greatly helping improve FCIL-SIS’s presence in high traffic social media venues. She is the new Co-Chair of the Publicity Committee (with Loren Turner) and is a founding member and Chair of the Customary and Religious Law Interest Group (CARLIG). Joot aek Lee – Jootaek is a Senior Law Librarian and Research Librarian for Foreign, Comparative & International Law at Northeastern University Law Library. Jootaek has served as Chair of the Nominating Committee; he contributed to the Mexican Law and Legal Research Guide; he has presented numerous times at AALL including as a panelist on Land Grabbing: Accessing Information to Protect Property Rights of Indigenous People and at the Diversity Symposium in 2014, and on Korean Legal Research in 2013. Jootaek is always cheerfully willing to take on any task that is asked of him and exemplifies the true spirit of our organization. Joan Policastri – Joan is the Collection Services and Research Library at the William A. Wise Law Library at the University of Colorado School of Law. She has worked in the area of Indigenous Peoples Law for many years and is the Chair of the Indigenous Peoples Law Interest Group. At virtually every AALL conference, you will find Joan participating in a panel (such as Land Grabbing: Accessing Information to Protect Property Rights of Indigenous People in 2014 or delivering a research guide or bibliography related to Indigenous Peoples. She also volunteers to lead activities (such as the Jurisdictions Joint Meeting) and interest groups without fail. Front page of informational flyer distributed at the FCIL-SIS Exhibit Hall table. The Customary and Religious Law Interest Group (CARLIG) met on July 19 at 11:30 as part of the FCIL-SIS Jurisdictions Interest Groups Joint Meeting. The group briefly discussed the year’s progress, which included acquiring approximately 35 members in My Communities, developing several programming proposals for the 2015 conference, and publishing an article in AALL Spectrum describing the group’s formation, purpose, and goals. The majority of the discussion then focused on 1) improving communication with the group’s membership in order to generate better response to the My Communities posts; 2) increasing the number of blogging and book review opportunities on customary and religious law topics and soliciting participation by the group’s members; and 3) developing and prioritizing additional projects for the coming year. CARLIG intends to continue proposing conference programming, and brainstormed a few ideas for the 2016 conference. The group discussed the possibility of putting together a panel of librarians and researchers who are currently working on comprehensive online portals or printed bibliographies of religious law resources. Kelly Buchanan, of the Library of Congress, also shared some preliminary information relating to an Islamic law program to be held at the Library of Congress in December. The group discussed potential opportunities for collaboration between CARLIG and the Library of Congress staff, which has been working on increasing the number of available customary law and religious law resources. 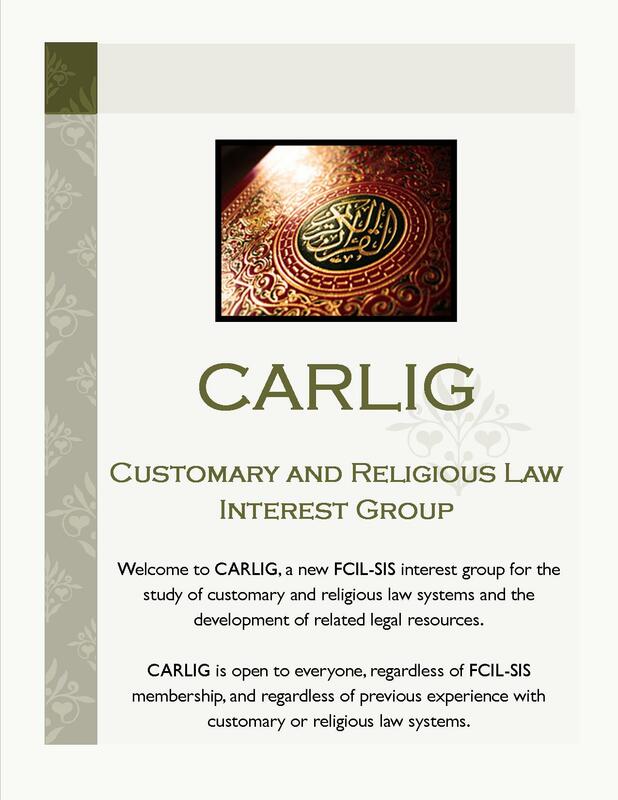 In addition to planning substantive programming, the group decided that CARLIG’s primary focus over the upcoming year should be to create teaching/research toolkits for customary law and for each of the major religious law systems. The purpose of these toolkits will be to encourage more librarians to incorporate customary and religious law research into their FCIL research classes or their presentations in substantive law classes. CARLIG will also work on some of the ideas proposed at the 2014 conference, including creating bibliographies of core resources for use in collection development, and identifying the major library collections in customary law and in each of the major religious law systems.